The diet revolution is here. And it’s armed. Plum Kettle does her best not to be noticed, because when you’re fat, to be noticed is to be judged. With her job answering fan mail for a teen magazine, she is biding her time until her weight-loss surgery. But when a mysterious woman in colorful tights and combat boots begins following her, Plum falls down a rabbit hole into the world of Calliope House — an underground community of women who reject society’s rules — and is forced to confront the real costs of becoming “beautiful.” At the same time, a guerilla group begins terrorizing a world that mistreats women, and Plum becomes entangled in a sinister plot. The consequences are explosive. 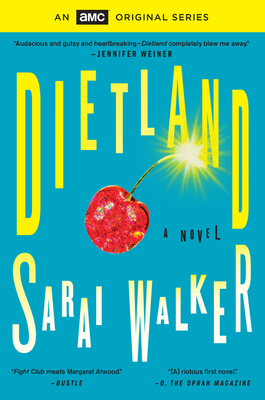 “A giddy revenge fantasy that will shake up your thinking and burrow under your skin” (Entertainment Weekly), Dietland takes on the beauty industry, gender inequality, and our weight-loss obsession — with fists flying. SARAI WALKER worked as a writer and editor for Our Bodies, Ourselves. Her articles have appeared in national publications, including the New York Times. She earned her MFA in creative writing from Bennington College and her PhD in English from the University of London. She lives in Los Angeles, CA. One of Entertainment Weekly's "10 Best Books of 2015"
One of Bustle's "2015’s 25 Best Books, Fiction Edition"
O, The Oprah Magazine, "10 Titles to Pick Up Now"
One of Vulture's "8 Books You Need to Read This May"
One of BookPage's "Best Books of 2015"
One of Kobo.com's "Must Read Fiction Debuts of 2015"
One of New York Daily News's "10 Books for Your Summer Reading List"
Women's National Book Association, "Great Group Reads 2015"
“Walker’s first novel leaves chick lit in the pixie dust, treading the rougher terrain of radical critique and shadowy conspiracies — territory closer to Rachel Kushner than Helen Fielding.”—New York Magazine, One of Vulture's "8 Books You Need to Read This May"
“Plum Kettle, a ghostwriter for a popular teen mag, is lured into a subversive sisterhood in this riotous first novel. Finally, the feminist murder mystery/makeover story we’ve been waiting for.”—O, The Oprah Magazine, One of "10 Titles to Pick Up Now"
"Fight Club meets Margaret Atwood in this absorbing thriller that weighs the expectations of society against one's own self-worth. "—Bustle, "2015’s 25 Best Books, Fiction Edition"
"In this slyly subversive feminist novel, 300-pound Plum plans to get her stomach stapled until a mysterious group of women convinces her otherwise — just as a militant, anonymous band of vigilantes called “Jennifer” begins wreaking havoc on bad men — dropping rapists from planes, blackmailing CEOs of exploitative newspapers — and inspiring regular ladies to do the same. Word of warning: While you may be inclined to try this at home, it’s probably better left in Walker’s competent hands and on her incendiary pages for now." —Entertainment Weekly, "10 Best Books of 2015"
"Just in time for the season where many feel shamed for their lack of a 'bikini body,' this new release explores a woman’s journey to accept that she’s fat. But it’s not just about feel-good self-love; Dietland develops into a full-fledged feminist manifesto. "—New York Daily News, "10 Books for Your Summer Reading List"
This is the perfect book to read during the snowy Maine winter. Grab your softest blanket, your largest mug of hot chocolate, and prepare to read through the night. It's a lovely, magical story that is a must-read for those who love fairy tales! It's considered a fantasy novel, but this would also be perfect for teens who love young adult fantasy. There are 2 other books in this series, and they are also fantastic!